Lumpectomy is usually done as a day care procedure where you are discharged home on the same day. Your doctor will be giving you a general anesthesia, where you will be asleep or a local anesthesia where you will be awake. In both the situations your doctor will make sure you will be free of pain. This procedure takes about 1 hour. Your doctor will make a small cut on your breast and removes the lump and some of the surrounding normal tissue as well. This is very important to know the extent of the tumor spread. Sometimes your doctor will remove some of the lymph nodes in your armpit to rule out spread of cancer. The lump will be sent to a pathologist who examines the histopathology of the lump, nature and extent of the tumor. After the procedure your doctor will close the skin with stitches which dissolve on their own. After the procedure you will be discharged on the same day of surgery. If lymph nodes were also removed, you may be asked to stay overnight and discharged the next day. You can continue breast feeding your baby even after the surgery as only a small part of your breast has been removed. 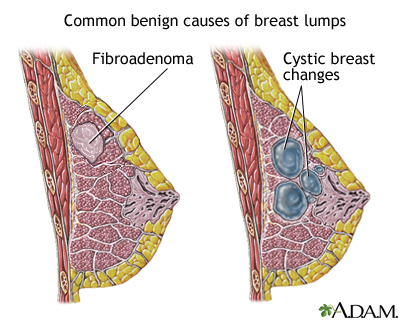 You may notice a change in the appearance of your breast like dimpling, scar, difference in shape between the two breasts or you may also have numbness in the breast area. 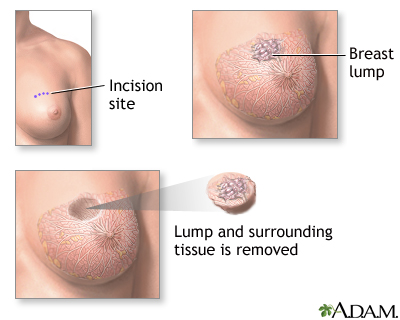 You may need one more procedure to remove more breast tissue, once the histopathology report is received. Other than these, you may have general risks of any surgery like bleeding, infection or reactions to medications. You have to visit your doctor after 7 days for wound review and general check up. During this visit your doctor will give you the histopathology report and discuss on further line of management if required. You should try to go for walks at least three times a day. Avoid activities that cause pain in the surgical area for 1 to 2 weeks. Try not to lift your arm on the side of surgical above your head level which causes strain on the surgery area, for few days. You can go back to your usual activities in a week or so. Wear a good form-fitting bra for 24 hours a day for five days following your surgical procedure. Remove it only when you shower. This helps to restrict movement of the breast to some extent and helps in wound healing. Do not eat or drink 8 to 12 hours before surgery, especially if you are going to be given general anesthesia. You may resume your usual diet as soon as you feel hungry. Drink plenty of fluids (water, juice, or Gatorade) for the first few days following your surgery.